Welcome to a our continuing series as part of our month long celebration of our fourth anniversary. This series is similar to our concepts page, but focuses on how each of the NHL's thirty teams could improve upon their current center ice designs. Some teams could use a lot of work and for each team we will post 2-3 ideas for how they might improve their ice. Lets face it though, some teams already have a perfect center ice but to be fair we will still look at some alternate ideas. Please let us know which you prefer in the comments below, or let us know if you think it is perfect as is. Its time for the Penguins. 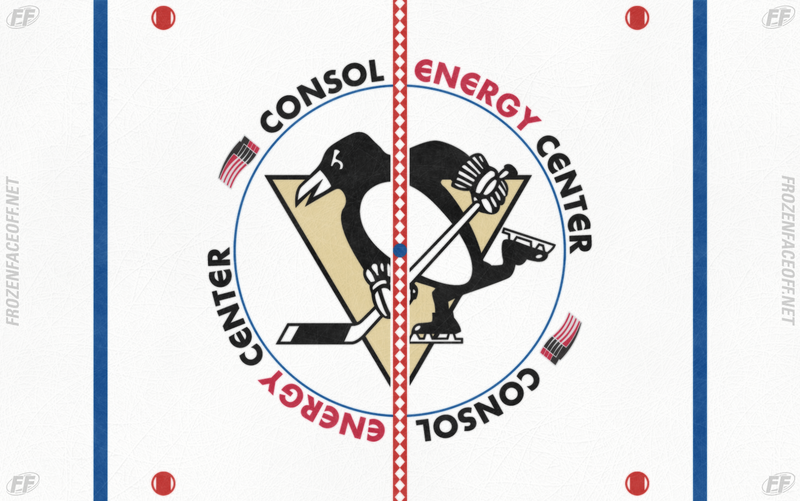 The Pens have not changed their ice design much over the last decade other than the arena word-mark to reflect the move to a new building. We can only speculate why they choose to go with the same design year in and year out. I would have to assume that it is because they found a look that works and see no reason to change it. I would have to agree with them, but in the spirit of this series, lets see if we can make some tweaks. Option 1: In this concept, the only change is utilizing the basic triangle pointing down to compliment the primary logo. Option 2: Another concept with very little change from the current design. This time we try out the old Penguins primary logo inside the red line in an attempted to tie in the past to the present. Option 3: This is a bit of a stretch for the Pens, but what if they were to bring yellow/gold back from their past and incorporate it at center ice. It is a bold design but I wouldn't mind seeing this. Option 4: Perhaps the Penguins should just leave the ice as is. If it ain't broken, don't fix it.